As early as 1770, coal barges reached deep into Germany, up the otherwise unnavigable Ruhr river to load up on the rich coal deposits that lined the river. The river was littered with dams and mills and the barges could only travel short distances downstream until they would need to transfer their loads into barges waiting on the opposite side of the obstacle. Every transfer reduced the quality of the coal and by the time it reached Ruhrort it was sometimes only dust. After the barges reached their final destination, they would be drawn upstream by teams of horses. Over time, 14 locks were built along the river to allow the barges to freely transport their cargo from as far deep as Witten all the way to Ruhrort without transfer. By the end of the 19th century, the water-based coal route was replaced by a railway. 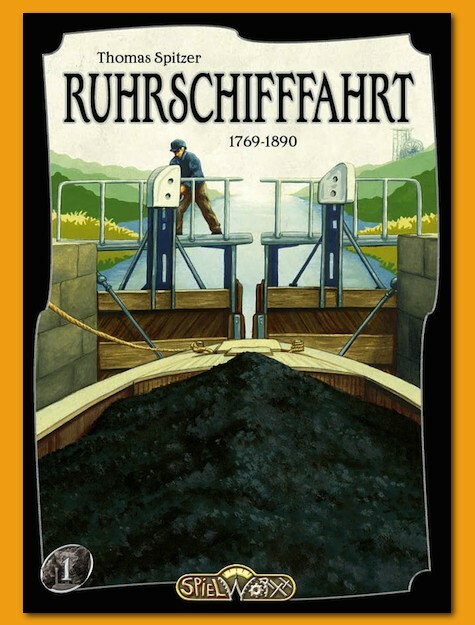 As you might imagine, Ruhrschifffahrt 1769-1890, gathers 2-4 players to transport and sell coal along the Ruhr river and to make it as profitable as possible. 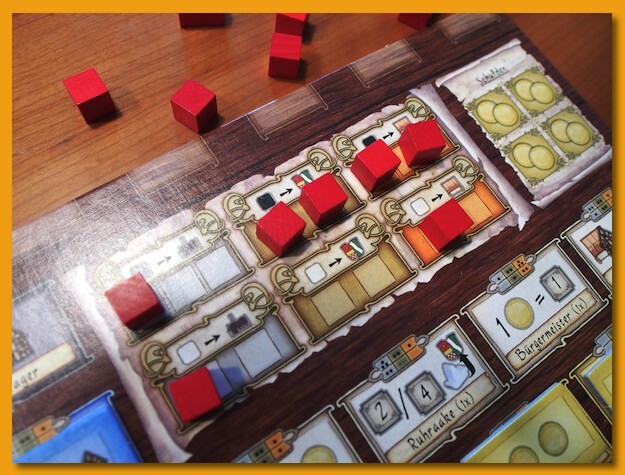 BGG classifies the game as a pick-up and deliver and a worker placement game but in my opinion that’s a bit misleading. 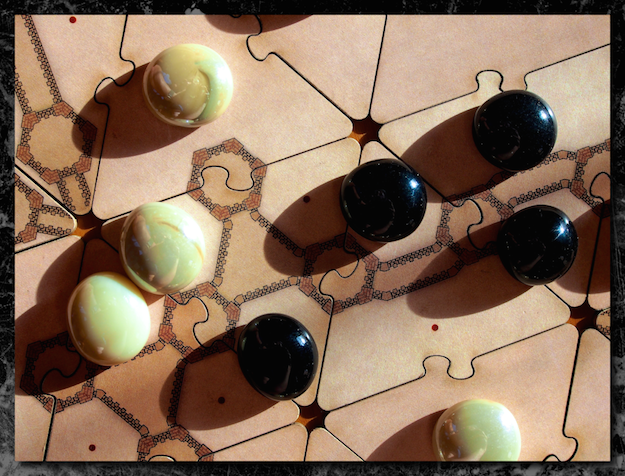 At the core is a set collection mechanic that players strive for to match patterns on an individual player board. Match specific patterns of delivery and you’ll unlock other features of the game allowing you take actions other players cannot and to establish board position to gain end-game victory points. 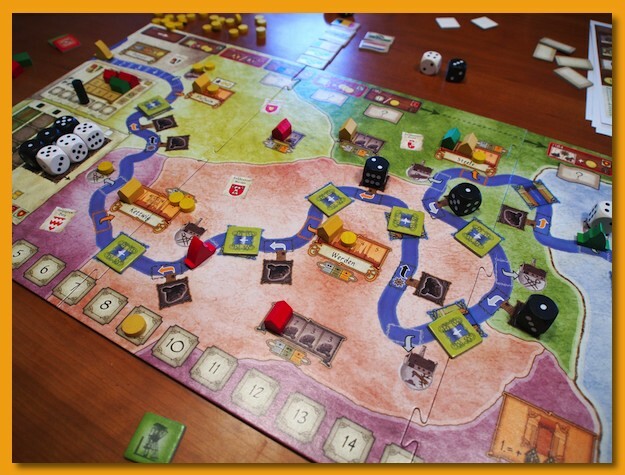 The board is split into two halves with the downstream half (the left western half closer to Ruhrort) “unlocked” at the beginning of the game. 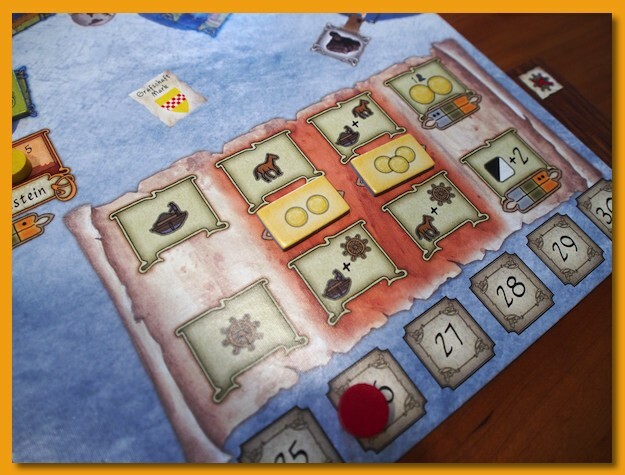 As the game progresses, players will gain the necessary tokens opening up the eastern half of the board. After the event/demand/obstacles are dealt with, players choose a single action and pay it’s cost. 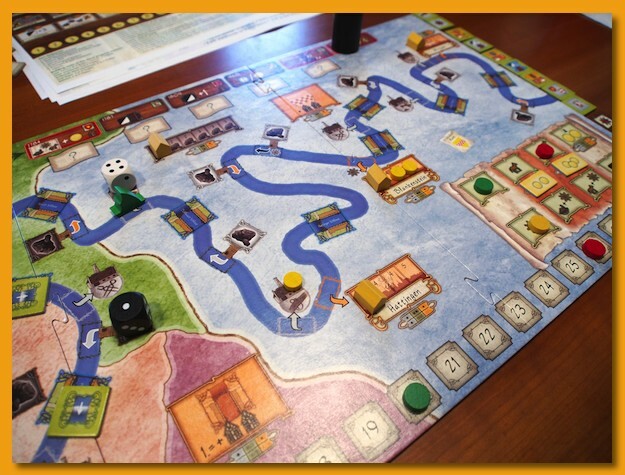 These actions allow players to haul their boat up the river to a coal deposit, uncover a new coal deposit, the freedom to ship farther downstream than is normally allowed, etc. Once chosen, the player’s coal barge is placed next to a coal deposit (a die). Some drawn obstacle tiles block the use of some of the actions for the round. Players are required to haul and deliver coal to a destination every single round. 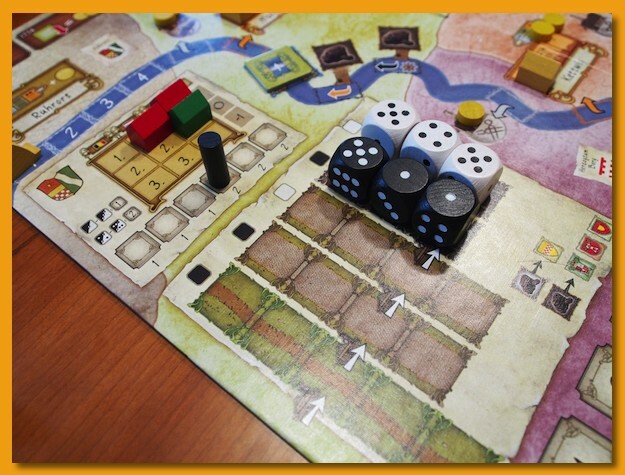 After all players have placed their barge next to a coal deposit (taking debt to pay to haul their barge up the river if they’re out of money), players ship their coal (the die) downstream to a delivery point, selling it for money. If the coal passed obstacles it loses value decreasing the amount of money the destination city/port is willing to pay for it. Players place resource cubes on a personal player board depicting where they’ve delivered coal and of what type (black or white). These resource cubes establish a pattern and if the pattern matches those of the individual tiles on the board (you can see the little dots in boxes above the tiles in the image below), the player earns the tile, unlocking a new feature of the game. Players start the game with a matching set of permanent game features they can unlock but there are some limited, one-time use markers that players can earn and then use when it’s most effective for them. Players are then free to purchase items with the money they’ve earned but you’re limited to what you can purchase based on what features you’ve unlocked in this and previous rounds. 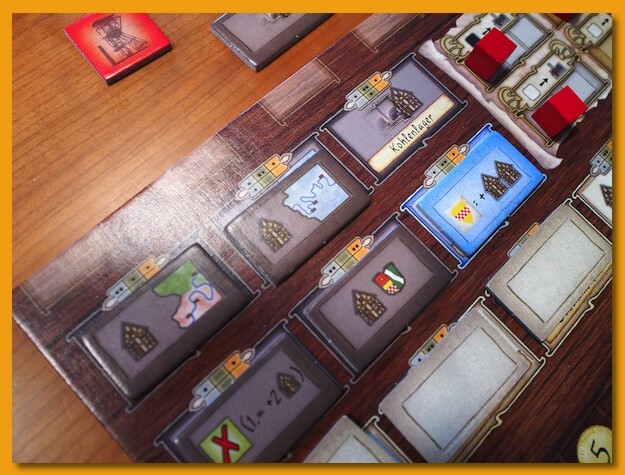 Players can build locks, build warehouses in the cities and coal depots, in Ruhrport’s export area, etc. Building things earns the players immediate victory points and helps establish end-game victory points depending on what features you’ve unlocked during the game. I really like this game. I’d read that the rules were a mess so I stuck to the rewritten rules available at BGG. Even using the rewritten rules requires some persistent reading. There’s a lot going on in those 12 pages of densely packed text. But stick with it; it’s worth it. The game rewards a player that sticks to a strategy but can remain flexible in the short term to weather particularly nasty demand/obstacle tiles or the effects of other player’s actions. 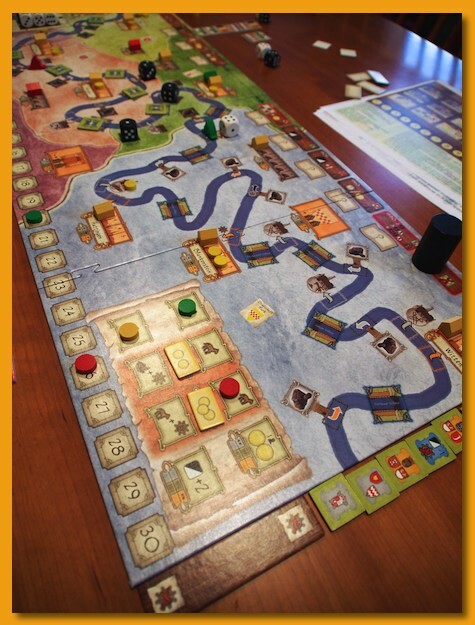 The game also features a highly variable turn order mechanism as one progresses through the different phases of a turn. As players vie for different positions to load high-valued coal and deliver it to locations needed to unlock feature of the game, turn order must be taken into consideration as it’s always east to west, down the river (highest upstream to lowest downstream). Some resources are limited and if you don’t go first you may miss out or at a minimum have to pay more to stick to your strategy. There is a lot of indirect player interaction taking spots other players want or need before they can making them shift tactics, pay more, or take debt at just the moment when they can least afford it. Points are tight, with the end-game in the low to mid-thirties in my experience. A copy of Ruhrschifffahrt is a bit hard to come by. I managed to pick up a copy in a BGG auction for about $50. Don’t be surprised, however, to pay $70 or more for a NIS copy. A few weeks ago, Jon Adams, contacted me to see if I would be interested in reviewing his new game Cartography before the Kickstarter launch on October 14th. I’m always excited to play a new game so I jumped at the chance. Cartography is an abstract but there is a hint of theme albeit small (think chess or Go). Players face off in a territory grab but there are no rules concerning dominance or majority. Instead, the game focuses on positioning. Early in the game, players focus on playing triangular-shaped tiles to the playing area to build up the map. Many of the tiles depict walls that segment the map into regions that become the regions to fight over. On each turn, players have the chance to place one “stone” onto a dot on the map expanding their cluster of stones in a region. If you can fully trap the other player’s stones into a corner of the region, you can capture their stones to earn points. Players take turns attempting to trap the other player until both players pass ending the game. Players count the number of stones remaining on the board and the number of captured stones and the player with the highest sum wins. 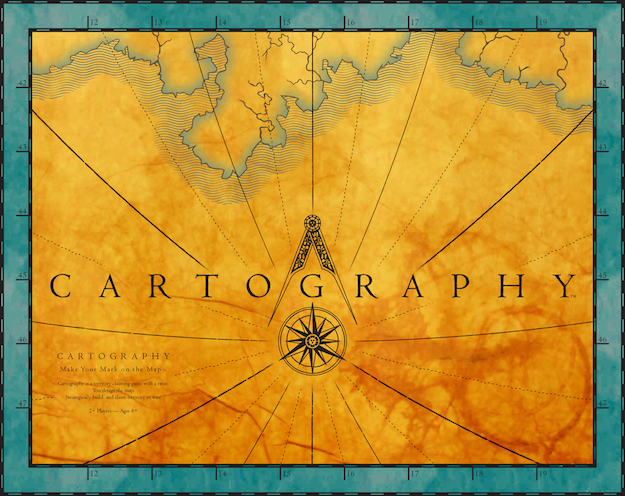 Cartography is often compared to Go but since I’m not a Go player that doesn’t hit home with me. I can see the resemblance, yes, but if I were to pick a game or two to compare it to, I would definitely choose Hive or Fjords. Both of these games are also abstracts that have a strong sense of positioning and to do well, you will need not only strong spatial skills but also patience. Unfortunately, I’m not a patient player which gets me into trouble quickly. In my opinion abstract games tend to reward the player that can recognize and capitalize on the other player’s blunder. Recognizing that blunder, however nuanced, is key of course. I usually mistake a seemingly poor move, with an aggressive response and only then realize, too late, that it was a trap. That’s not necessarily a bad thing. Many gamers enjoy this tight, head-to-head match-up in an all-or-nothing battle of skill and cunning. That’s not my style of game but I greatly appreciate the effort and the design. It’s very elegant and I can see how other players would like this. I know of a mother/son duo that would love this game and I’m hoping to introduce it to them in the coming weeks. I wish Jon a lot of luck on his launch. I really think there are some good ideas here and it really looks great even at the prototype stage. Very well done Jon! Keep an eye out for this on Kickstarter, I know I will be.